Have the folks you work for ever been short of the right number of people in the tech department? 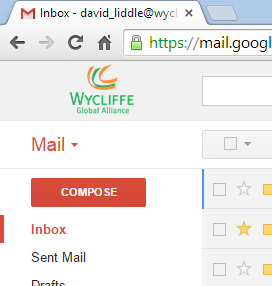 I wrote that Wycliffe is in the process of shuffling people from one email system to another. That’s a big job. There are probably more people than ever in jobs like mine, but it seems that there aren’t quite enough to make this project go as smoothly as we might hope. So I finished the accounts for Wycliffe Slovakia, and my colleagues here are working on accounts in Switzerland, Finland, France, and other countries, bit by bit. I moved on to the accounts at the organizational level above us, to finish off the folks at the top. (No pun was intended there … OK, it was, but only in fun.) I have just a few stragglers to chase down in that group. With my plate nearly clear, I’ve offered to work on other groups who seem to need help getting going. I can see from our records that there are many accounts waiting to be moved in these places. They just don’t have tech workers free to put their time into this task of ours. Next stop? The Americas, apparently. Not Wycliffe USA, mind you—they’re all done with their staff. And not Canada, either. I’m talking about the people who help and guide the Wycliffe offices in Central and South America. They have a few dozen accounts that need to make the move—but they don’t have anyone else to work with them right now. Clearly, the difference between time zones (3-7 hours?) is going to reduce the time each day that I have to get connected with people. If you think of me while praying, please pray for good, timely communication, clear thinking, and quick, skillful work. Thanks! P.S. Here’s a shout-out and some accolades for the Bomgar company, whose technology makes such work possible. They’re terribly good to us, and we couldn’t do it without them! Would Michael Phelps have won so many gold medals in 2008 if he hadn’t swum to the wall with everything he had in him? My email migration team and I are approaching the wall in our project. We are on an excellent pace, doing far better than I expected – we have finished more than 95% of all the accounts. I expect us to be done by the end of this month. But we can’t let up now and just coast in, and we can’t stop short of completion. The last 5% require more effort now that we’re so close. We have a mix of people who are left. Obviously, there are folks who have put off the process as long as possible. I understand that. Do you remember worrying over the order in which kids were to present their book reports in school? Most kids wanted to be at the end – and they’re the same way now as adults! There are also people who have schedules that are difficult to accommodate, and there are people who are traveling out of the country. This week, I have to orchestrate the migration of some accounts for a couple who are so far out in the boonies on the other side of the world that they’re not even in email contact. I have to plan this in such a way that they don’t freak out when they return to the nearest city and that there’s someone on hand who knows enough about the situation to help them “get connected” again. These people are folks I do not wish to disappoint – the fellow’s a well-respected anthropologist who helps translators understand the people they’re working with. This cultural knowledge helps the message of the translated Bible really shine into the hearts of the people who read it.